Within her agency, Stéphanie Coutas surrounds herself with the best professionals and integrates into her team the young talents she spots in the Parisian universities. Today we draw the portrait of Mathilde, an inspired interior designer. 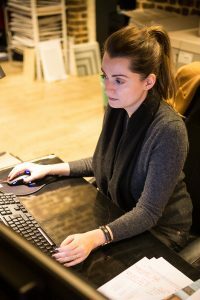 Mathilde, as an interior architect, how would you describe your typical day at SC Edition? My assignments are fairly varied and depend on the projects currently under way. For some, I create material boards in order to showcase Stéphanie’s ideas. For others, I produce elevations (cross-section design) and plans on the computer presenting the walls, furniture, materials and colours of a project. Stéphanie builds upon this base then presented to the clients. Finally, I help to supervise two work sites in Paris for the interior layout and decoration of private residences. The agency offers a luxurious level of services incorporating the work of several craftsmen. What are the necessary conditions for perfect coordination? Sometimes several months go by between the production of the boards and the fitting out of an apartment. Stéphanie supervises every stage and makes the necessary adjustments as the project develops. When a project is finished, we organise delivery of furniture, rugs, textiles, etc. within a short time frame. The orders are brought forward so that everything is delivered, as far as possible, within this window. Particularly as a large number of our creations are made-to-measure. The agency plays the role of an orchestral conductor, directing the companies, craftsmen and our own staff so that everyone comes in at exactly the right time. The team incorporates young talents found at prestigious Parisian higher education establishments. Today we are profiling Mathilde, an inspired interior architect. SC Edition also works on interior layout and decoration projects for individuals. How do their tastes influence your choices? Every client arrives with his or own background, requests and constraints. They contact Stéphanie because they value her work. They have often had the opportunity to visit her apartments and want to have her style in their own home. We play an advisory role, opening up new horizons to them and guiding them towards trends that they would never have otherwise considered. Stéphanie interprets their expectations and we make proposals that are as close to their desires as possible, providing an ambiance for their entire home in order to ensure an attractive harmony. How would you define SC Edition’s style? Stéphanie is constantly renewing herself. She is an avant-garde designer who creates interiors around an object or material. For example, when Stéphanie goes to the Marbrerie de la Seine, she picks out a plaque and can instantly envisage it in a future project. She imagines a bathroom, an item of furniture, a headboard, the floor of an entrance hall. It’s very inspiring being with her during this creative stage. What role does light play in the framework of stage setting? The choice of lighting is essential in order to highlight the decorative object and works of art. It also adorns the ceilings thanks to the chandeliers and lamps designed by Stéphanie, like when she collaborated with Baccarat . The entire space will be inhabited by this radiance, reflected on the curtains. When you first started working at the agency, which were the projects that made the greatest impression on you? Having joined the luxury decoration sector I discover extraordinary projects every day. Stéphanie’s constant ability to enrich her style, in collaboration with the artistic craftsmen, opens up the field of possibilities exponentially. If I could only retain one project, it would be Stéphanie’s collaboration with the Tai Ping brand. These rugs are true works of art with incredible dimensions (6 x 7 metres) that nonetheless perfectly integrate into the formal lounges that we decorate. New trends, innovations, how do you stay ahead in the luxury field ? Our research work lies at the heart of our creative process. The team works in close collaboration with our suppliers who present new collections every year. We travel to the showrooms of our cabinetmakers and stonemasons. We take part in professional trade fairs. Every new idea is shared within the team. If a piece has appealed to us, it could become part of a project already under way. Finally, Stéphanie regularly presents the work of artists whom she follows closely. What are your new projects for the coming year ? We are soon to begin a new project at a hotel in the Côte-d’Or department (Bourgogne in France). Stéphanie has already worked at this establishment. The owner wishes to continue working with her. 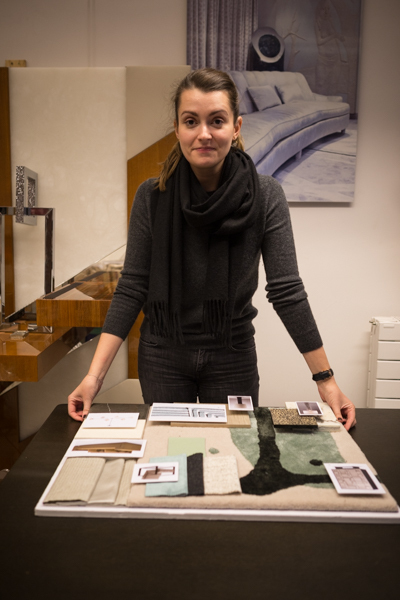 Stéphanie has entrusted a selection of fabrics, headboards and furniture to us: it is creation in the making, and I am tackling it with great enthusiasm.